Application of the original vitrification protocol used for pieces of heart valves to intact heart valves has evolved over time. Ice-free cryopreservation by Protocol 1 using VS55 is limited to small samples where relatively rapid cooling and warming rates are possible. VS55 cryopreservation typically provides extracellular matrix preservation with approximately 80 % cell viability and tissue function compared with fresh untreated tissues. 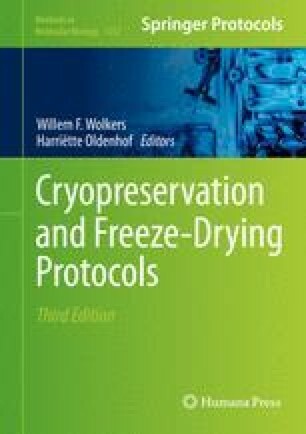 In contrast, ice-free cryopreservation using VS83, Protocols 2 and 3, has several advantages over conventional cryopreservation methods and VS55 preservation, including long-term preservation capability at −80 °C; better matrix preservation than freezing with retention of material properties; very low cell viability, reducing the risks of an immune reaction in vivo; reduced risks of microbial contamination associated with use of liquid nitrogen; improved in vivo functions; no significant recipient allogeneic immune response; simplified manufacturing process; increased operator safety because liquid nitrogen is not used; and reduced manufacturing costs. This work was supported in part by a US Public Health Grant from the National Institute of Biomedical Imaging and Bioengineering, Grant # R43 EB014614, to KGMB. The content is solely the responsibility of the authors and does not necessarily represent the official views of the National Institute of Biomedical Imaging and Bioengineering or the National Institutes of Health. Commercial use of protocols disclosed in this work is subject to several issued US Patents (6,194,137; 6,596,531; 6,740,484; 7,157,222; 8,440,390) and International Patents (available upon request).